Friday September 11th 1891 We were busy about the work all forenoon and in the afternoon Will took Mother, Fanny, and I to the valley. We called at Aunt Ellens. Agnes had supper ready when we got home. weather warm and dusty. Saturday September 12th 1891 We done quite a washing this forenoon and ironed in the afternoon besides making some changes up stairs. Mother put up plums and made jelly. I rode over town with Will after supper to spend the evening with Fanny Heavy rain last night. Sunday September 13th 1891 We was busy about the work most of the forenoon. Agnes did not come back. Father and Mother went over to Eugene Harts for dinner. I wrote to Vene in the afternoon. Will hitched to the Surry and we took the children to ride before going for Father and Mother at four oclock. Ott & Fanny were over to spend the evening. Monday September 14th 1891 It was a warm day. Will took Fanny and I up to Otts farm for grapes in the morning. I finished my work for Moore after dinner and took it back. It was wrong and I had to do some of it over again. Ott & Fanny were over in the evening. beautiful noon light night. 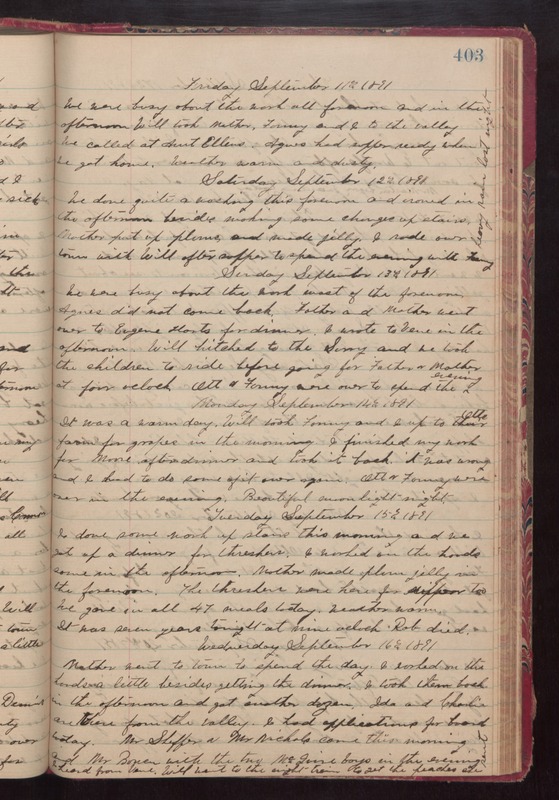 Tuesday September 15th 1891 I done some work up stairs this morning and we got up a dinner for threshers. Mother made plum jelly in the forenoon. The threshers were here for supper too. We gave in all 47 meals today. weather warm. It was seven years tonight at nine oclock Rob died. Wedensday September 16th 1891 Mother went to town to spend the day. I worked on the hoods a little besides getting the dinner. I took them back in the afternoon and got another dozen. Ida and Charlie are there from the valley. I had applications for board today. Mr Sheffer & Mr Nichols come this morning and Mr Bowen with the two McGuire boys in the evening. I heard from Vene. Will went to the night train to get the peaches she sent.